The genius who devised the unique dining scheme on Disney ships should win an award for creativity on the seas. Although we enjoy traditional set-seating dining, it's rare that we actually show up in the dining room every night on a seven-night cruise, often choosing room service or the casual buffet at least once. Disney's rotational dining program makes it fun and exciting to go to dinner. Here's how it works: You eat every night at the same time, with the same dining companions and servers, but show up at a different main restaurant each night. There are three main restaurants on Disney Magic -- Animator's Palate, Lumiere's and Rapunzel's Royal Table -- and every cruiser gets to dine in each of them at least once (twice on weeklong cruises). Dining times are set at 5:45 and 8:15 p.m. As always on family-friendly cruise ships, the earlier dining times cater to families with young kids, so plan accordingly. The actual rotation you are assigned makes little difference in the overall dining experience, except that you might dine in the first dining room on your rotation more than others, depending on the number of nights in your cruise. Preferred rotations can be requested at time of booking, but they're not guaranteed. We experienced firsthand the benefits of having the same wait staff each night, as one of our tablemates with a wheat allergy was presented each night with her very own basket of gluten-free bread upon sitting down. Additionally, we witnessed endearing bonds between families and their servers, who played games and made napkin hats for the little ones. All menus in the main dining rooms are divided into sections: specialty cocktails, appetizers, soups and salads, a bread selection, main course, vegetarian and lighter note offerings. Gluten-free, vegetarian and dairy-free dishes are noted on each menu. A plus for gluten-free eaters: Warm, soft bread is available in every restaurant. While the regular menus do include kid-friendly options, separate menus (which rotate daily) are available for little ones; they include entrees like mac-n-cheese, a mini-burger and whole wheat penne pasta and desserts such as apple slices and a yogurt parfait. Breakfast is available in Cabanas buffet, Daisy's De-Lites and Lumiere's, free of charge (specialty drinks and smoothies are available at Lumiere's for an extra charge). During disembarkation, breakfast is served in all main dining rooms. One morning of each cruise is dedicated to a Character Breakfast, which features a special menu -- including the line's famous Mickey waffles! -- and the opportunity to meet and take pictures with Mickey, Minnie and other characters. Note: Disney offers soft drinks (Coca-Cola products) free of charge at meals and at the 24-hour drink station on Deck 9 aft, but if you get them from a bar or room service, you'll still have to pay. 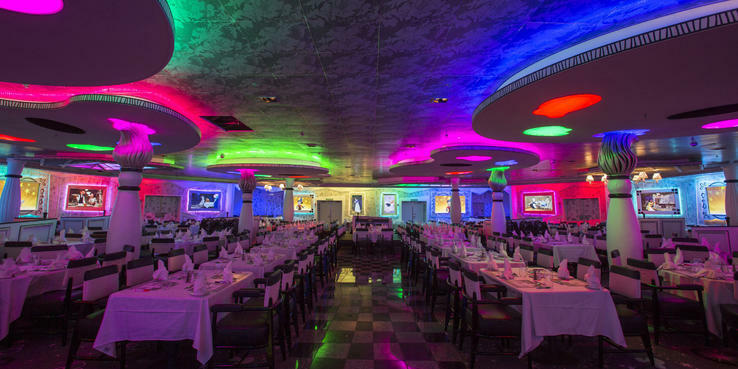 Lumiere's (Deck 3, midship): Named after the beloved candlestick from "Beauty and the Beast," Lumiere's is the fanciest and most traditional dining room of the three. It boasts a ballroom feel with Art Deco decor and subtle tributes to the film, such as "enchanted roses" hanging from the chandeliers. The French-inspired menu includes starters such as escargot and duck confit, and main courses like chateaubriand-roasted filet steak and wild mushroom pasta. Animator's Palate (Deck 4, aft): This whimsical venue uses Disney's unique ability to create magic out of the mundane. Animator's Palate starts out in stark black and white, but during the course of dinner, it changes slowly into a room filled with color. Dinner shows are displayed using high-definition flat screens on the walls. On "Animation Magic" night (only on sailings of at least seven nights), diners contribute their own show, drawing characters that later appear on the screens interacting with real Disney characters. Starters include salmon tartare, sliced serrano ham and butternut squash soup, while entrees include black bean chipotle cakes and a ginger-teriyaki dusted beef tenderloin on top of wasabi mashed potatoes. Rapunzel's Royal Table (Deck 3, aft): Available only on Disney Magic, the ship's "Tangled" themed restaurant was added in a 2018 dry dock. It combines entertainment with a meal, in an Oktoberfest-meets-Ren faire setting enhanced by a ceiling dripping with the sun-embossed lanterns of Corona. The food here is Germanic and heavy, think pork platters, pretzel bread and prime rib. Characters come out between courses and sing songs from "Tangled," although it's hard to see what's going on unless you're at a center table. Cabanas (Deck 9, aft): Touting a vibrant "Finding Nemo" theme, Cabanas -- the ship's buffet -- is conveniently located at the back of the ship, steps away from the kids' Splash Zone. Breakfast includes usual favorites, such as made-to-order omelets, meats and bakery treats (gluten-free muffins also are available). The lunch menu changes frequently but includes the standard soups, salads, sandwiches and burgers, as well as kid-friendly mac-n-cheese and chicken fingers. For dinner, passengers can order signature dishes off the Main Dining Room menus, as well as other cooked-to-order items; it's a sit-down setting instead of a buffet at night (other than embarkation day and the night before debarkation). The buffet also occasionally hosts theme nights, such as after the "Pirates of the Caribbean" deck party, in which the room and stations are decorated and fun foods such as bubble gum ice cream and make-your-own-crepes are offered. There's a special menu on Marvel night, too. Dining times vary for each meal, so be sure to check your daily planner for specific hours. While we appreciated the buffet's variety of seating arrangements (booths and large six- and eight-top tables ideal for families), we found the space to feel cramped, even with seating outside. There wasn't much open space, which led to occasional confusion as to where the lines began and people having to squeeze around one another. Duck-In Diner (Deck 9, midship): Situated on the other side of the kids' Splash Zone, the Duck-In Diner serves Middle Eastern shawarma made with chicken and lamb from 11 a.m. until 10 p.m.
Pinocchio's Pizzeria (Deck 9, midship): For families looking to grab a quick bite without having to leave Goofy's Pool, Pinocchio's Pizzeria serves up a variety of slices from 11 a.m. until 6 p.m. (noon to 3 p.m. during visits to Castaway Cay). Both vegetarian and gluten-free options are available. Pinocchio's reopens from 7 p.m. to 8:30 p.m. for a light dinner and 9:30 p.m. to midnight for late-night snacking. Daisy's De-Lites (Deck 9, aft): Lighter lunch options can be found at Daisy’s De-Lites, nestled near the entrance to Cabanas. It serves fresh fruit, salads, wraps and sandwiches (like grilled chicken and turkey with cranberries) and cookies, from 11 a.m. until 7 p.m. Eye Scream Treats (Deck 9, midship): Complimentary self-serve, soft serve ice cream is available throughout the day (check your Personal Navigator for specific times, as they tend to vary). Chocolate and vanilla are served every day; on occasion, the venue will offer other flavors such as banana and strawberry. Cove Cafe (Deck 9, forward): The cafe in Disney Magic's adults-only area offers complimentary pastries, ranging from croissants and chocolate puffs to apple tarts and glazed doughnuts. Specialty coffees and teas are available for a fee. Room Service: Room service on Disney Magic is fast and efficient. The menu is relatively simple, with soups, salads, sandwiches (cold and hot), burgers and pizza. In-room breakfast is continental only -- but a great alternative to the buffet on crazy port days -- and ordered via a card that's hung outside your cabin door the night before. Suite passengers get hot breakfast options and dining room meals delivered upon request. Palo (Deck 10, aft); $30: Reserved for adults only, Palo is Disney Cruise Line's dedicated Italian restaurant. It's open for dinner and a Champagne brunch; both meals levy a $30 per-person charge. The restaurant serves Northern Italian cuisine in a warm, neutral setting with a wall of windows and scenes from Venice throughout; live piano music also sets the mood. Standout dishes include the Tuscan white bean soup starter, Dover sole entree (filleted tableside) and chocolate souffle dessert, which can be made gluten-free. For the ultimate date-night splurge, a special menu with wine pairing is available for $89 per person. The Champagne brunch features a cold buffet with seafood and meats, breads, salads, cakes and desserts, plus a hot made-to-order selection of eggs, meat and fish. Book either meal early, as the restaurant is small; while dinner is available nightly, the brunch takes place only three times per seven-night cruise. Preludes (Deck 4, forward); a la carte: Two quick-service snack bars -- located on both sides outside the Walt Disney Theatre on Deck 4 -- serve buttery popcorn buckets, pretzels, chips, cookies and candy in addition to bar drinks, bottled water and coffee (all for an extra charge) during shows. It operates from 5:30 to 9 p.m.
O'Gills Pub/Snuggly Duckling (Deck 3, forward); a la carte: This Irish bar features free bar snacks such as nachos and hot dogs around Happy Hour time. There's also an a la carte meal with bar favorites such as a German pretzel, loaded Tater Tots, burger sliders, fried coconut shrimp and bangers and mash -- each ranging from $8 to $12. On "Tangled: The Musical" nights, O'Gills -- part of the adults-only After Hours hangout spot -- transforms into the Snuggly Duckling, a tavern in the woods near Rapunzel's tower. "Tangled" decorations adorn the space, while servers dress up and take orders from the same menu. Royal Court Royal Tea (Deck 3, midship); $279: In addition to organized meet and greets, little ones can meet their favorite characters at Royal Court Royal Tea. Held once per cruise in Lumiere's, for kids 3 to 12 years, it's essentially a fancy tea party, complete with character visits, special table settings and a spread of juice in tea cups, sandwiches, cupcakes and little gifts. The experience costs $279 for two passengers (one adult and one child) and $69 for each additional child. Tip: We recommend booking Royal Court Royal Tea in advance, as it tends to sell out fast.